Establish Tipperary County Council as the key point of first contact and driver of new and existing Diaspora engagement projects. Continue to work closely with Connect Ireland in conjunction with Chambers and Business Groups. Disseminate information on the Diaspora supports available to local communities and business organisations so that Tipperary gets it fair share. Actively support new and existing Community organisations to implement their project plans through the provision of advice, mentoring and event management expertise. Take advantage of all leads generated through the various Diaspora projects and bring to bear supports and where appropriate make other agency referrals. Showcase and champion our examples and models of best practices across the 4 areas of Culture & Heritage, Genealogy, Communications and Networks which in turn will act as a catalyst to new Groups in respect of future funding calls. The Tipperary County Council approach is to leverage current and future funding streams and position Tipperary to get its fair share of FDI, tourism, genealogy, business investment, jobs and most of all profile in both national and international markets. Co-ordinated and more focussed Diaspora engagement will ensure that all new connections will be maximised for the County going forward. 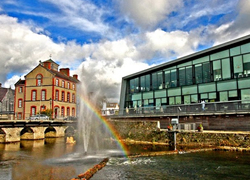 Tipperary with a population of 158,754 is one of the most populated rural Counties nationally. Tipperary is the 6th largest county in Ireland with a land mass of 4,303 km sq. The county is centrally located, is bounded by eight counties and no part of the county touches the coast. The County adjoins three of the provinces of Ireland and has high quality linkages (i.e. FAI boss John Delaney has teamed up with a proud Tipperary community in a global drive to harness the power of the diaspora and attract high quality jobs to a part of Tipperary which has suffered more than its share of knocks during the downturn. Helen Fox and Bill Ryan co-authored the booklet Ottawa 2015 - Finnoe, Kilbarron, Terryglass 1815 and are Parish Liaisons for Kilbarron Terryglass Ireland Reaching Out. 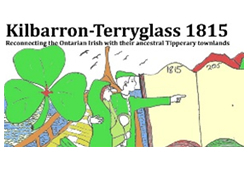 Both are active members of Kilbarron Terryglass Historical Society.